Our third and final week in the Durango area has come to an end. We originally only intended to spend one week here, so it was nice to have the extra time. Between the two weeks we spent in the area last year, and the three this year, we are leaving with a really good feel for this small city. Instead of re-capping our entire week (which included three days in row where we took refuge from the heat by spending nearly all day inside working with the AC on), I am instead going to share a few highlights and final thoughts. We enjoyed our stay at the Westerly. Private RV parks are never our first choice, but we wanted to spend a week near town, and we also knew that with the holiday weekend coming up every campground was going to be a madhouse. So a few months ago I booked the Westerly based purely on the fact that it was the smallest of the four parks in town. When it comes to private parks, we tend to prefer the smaller ones. There’s nothing worse than a giant block of 150 RVs parked in rows with no room to spare in between. No thank you! Even though the park was nearly full most of the week, it was relatively quiet (there was a little road noise from nearby 550), and we had a nice site on the edge of the park that backed up to a small grove of trees. The Westerly is one of those parks where you share utilities with your neighbors on one side, and your front yard with the neighbors on the other side. I usually hate this set up, but the sites were spaced far enough apart that it wasn’t a big of a deal. And by some dumb luck our neighbor who we would have shared the yard with was absent for the entire week. 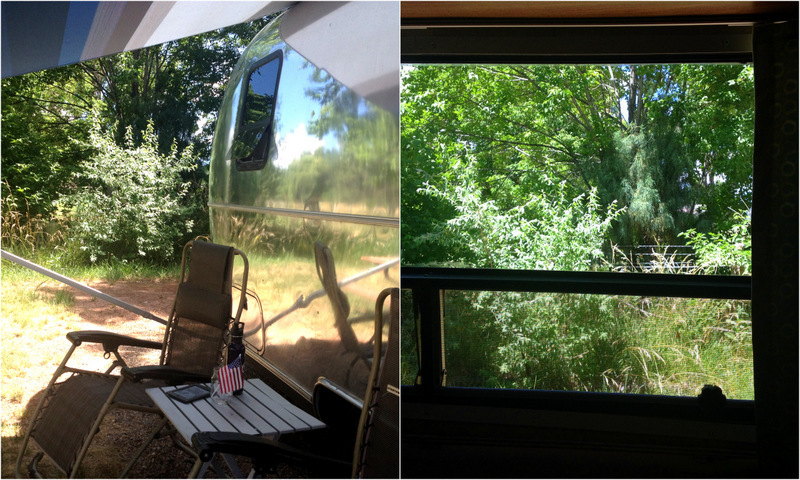 So while we did have a view of an RV from our yard, it was an unoccupied RV. The Westerly gets mixed reviews online. Half are folks who, like us, thought it was a nice small park with decent sized sites and a very friendly, helpful camp host. The other half were the whiney folks who complained about the lack of amenities. The Westerly is a self contained park with no bathrooms or showers, but they do have a nice laundry room. There is also no pool, no playground, or anything else along those line. We didn’t find this to be an issue, but apparently others did. 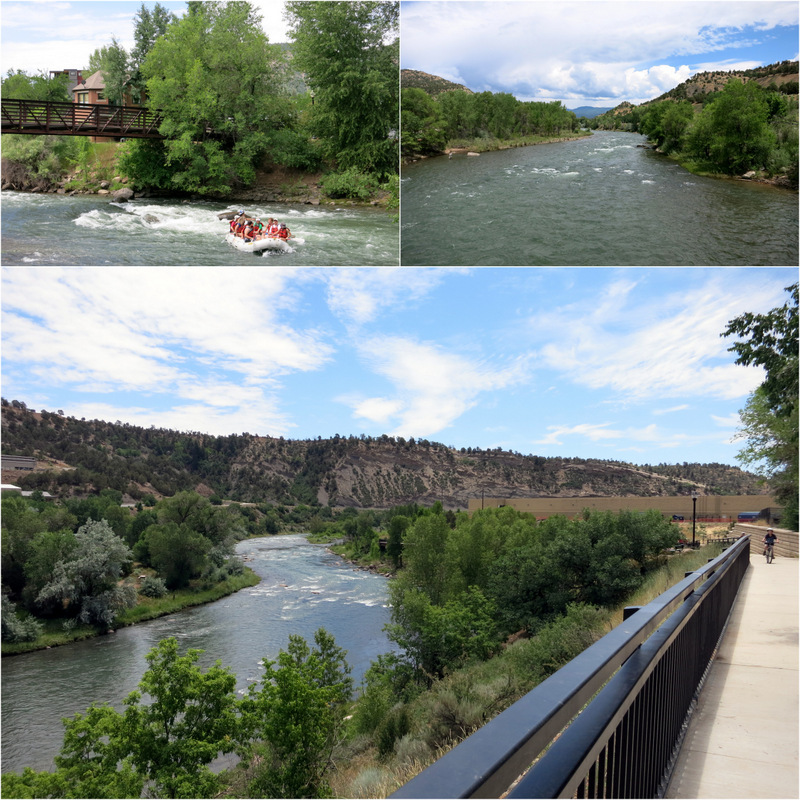 Durango has a very nice bike/walking path that runs alongside the Animas River. The entire trail is about 7 miles long. It travels through several parks and open space areas, providing easy access to downtown stores and restaurants. We parked near the north end of the trail and biked nearly the entire trail in both directions. It was fairly busy in some sections (to be expected on a sunny Saturday), but with the expectation of a clueless lady who stepped in front of Tim almost causing a collision, and a sulky teenager laying across the middle of the trail who I was tempted to run over on purpose, we managed to make it through the crowded areas and had a very nice bike ride. 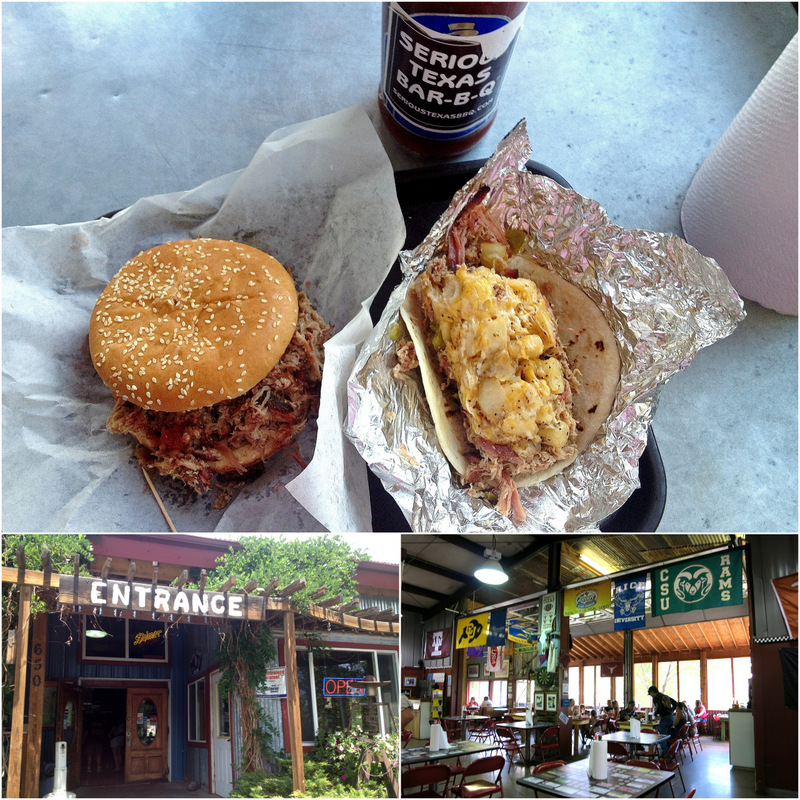 Our final meal out in Durango was at Serious Texas BBQ where – no surprise- they serve up some seriously good BBQ. This restaurant is part of a local chain with several locations around CO and NM. They actually have two locations in Durango, and since we heard good things we decided to try them out. As luck would have it one of the locations in right off the bike path, which made for a delicious mid-ride lunch. I ordered the Texas Taco which consists of BBQ topped with cheesy potatoes, jalapeños and onions. Tim had the pulled pork sandwich. We both agreed that while the pulled pork was good, the Texas Taco took the prize. The combo of spiced cheesy potatoes and succulent BBQ smothered in their signature tangy sauce was hard to beat. Also on a side note: how can you not love a restaurant where each table is equipped with a full size roll of paper towels and a giant bottle of BBQ sauce? It’s probably a good thing that we didn’t try this place out until our last day in town. Otherwise, I am sure we would have made a return visit or two. 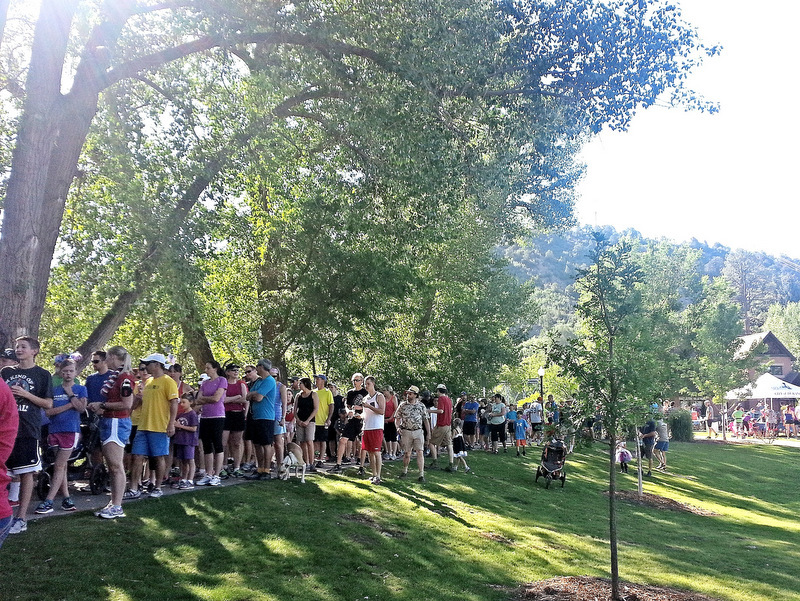 Our Durango 4th of July started off bright and early with a 5k fun run on the bike path. This was our first official 5K since we started our running program this winter. It should have been a breeze since we run this distance and much farther 3 times a week, but for me at least, that wasn’t the case. I think part of the problem was that I am used to running alone. I like the solitude that running provides and it really threw me off to have hoards of people, strollers, kids, and dogs all around me. I was pretty disappointed with my final time, which was significantly slower than normal. Tim had the opposite experience and sailed through the course with a faster than normal time. Even though I hated it at the time, I think I would do it again if we happened to come across another 5K, but I doubt we’ll be actively seeking them out. After the run we went back home and spent the afternoon relaxing at our site. It began raining at some point, but miraculously stopped right before the start of the 6:00 parade. As far as parades go this one was a bit lacking, but we still enjoyed ourselves. What was lacking was actual parade floats. 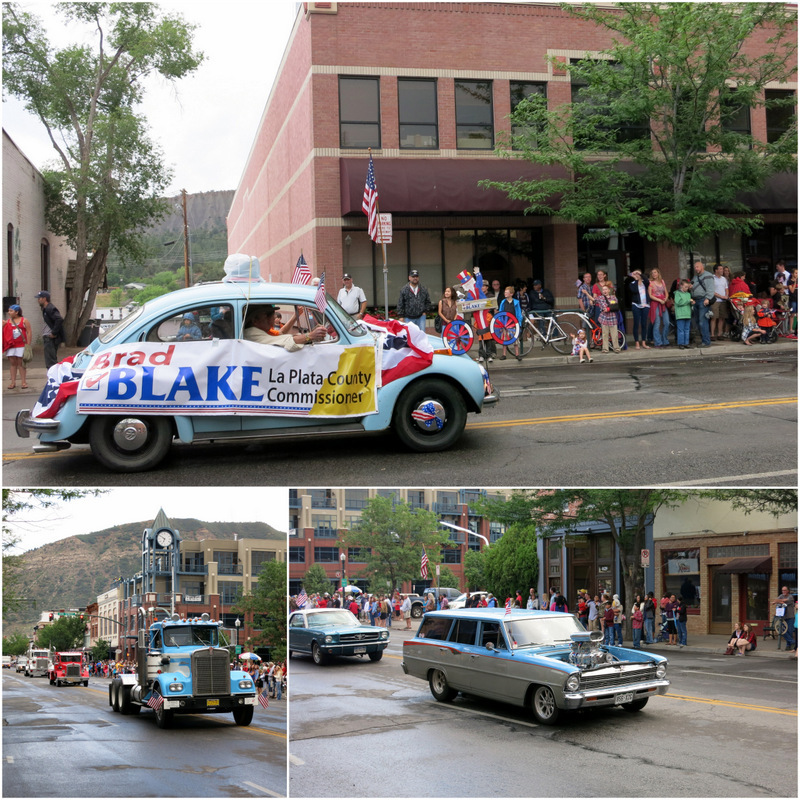 There were lots of waving politicians in cars and trucks with banners, even more local businesses with nothing more than a vehicle and banner, every privately owned big rig in town, and the obligatory line of classic cars. It wasn’t all bad. I mean at least the shriners were there. And who doesn’t love old dudes riding go carts!!!! There was also a bear dressed as the Statue of Liberty, a cool VW single cab truck, a local car detailing company spraying the spectators with a fine mist, and the crowd favorite- a blow up giant fireman. 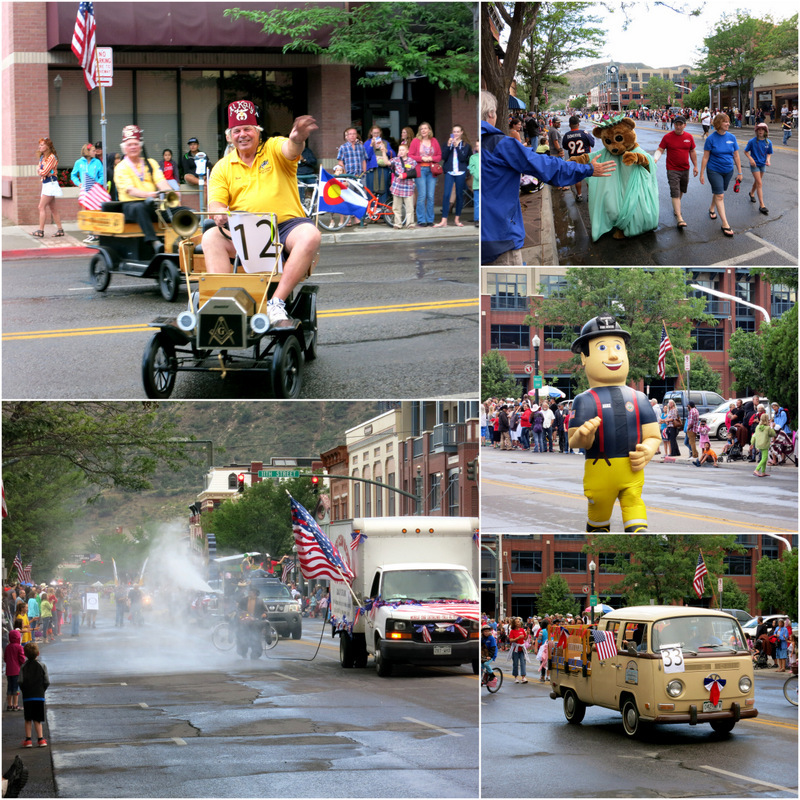 All in all not a bad parade, but I think the one in Leadville last year was better. After the parade we walked around downtown, caught a few minutes of a live country music show, and eventually found a place to eat that didn’t have too long of a wait. It was a forgettable restaurant and a forgettable meal, so I won’t bother boring you with the details. After dinner we walked around a bit more waiting for the start of the fireworks. They set them off from a ridge above town which means you can see them from nearly any downtown street. We ended up watching with a a group of other people standing in the middle of a side street. We weren’t blown away by any means, but it wasn’t a bad show. It was definitely a different experience watching fireworks in the middle of a town with streetlights, buildings, and the occasional car going past. That wraps up our time in Durango. Things have really started to heat up down here and it’s time to head up into the mountains for some cooler temps and more mountains hikes. Up next: the historic town of Silverton! Looks like a great time in Durango…but you’re now in my all-time favorite area — Silverton/Ouray. I had a blast doing the 4WD trails there back in 2011, and also going up high on the hill just south of town to get a birds-eye view of the train coming in each day! Can’t wait to get back there again someday…gorgeous country! We’ve only been here for a few days and already love this area. Went on an amazing 4WD road yesterday and found a ghost town! We saw some wildflowers on our drive up into the mountains yesterday, but I am waiting till next week when we get to CB to see the real show! I love Durango and all of the San Juans, really. We’ve never hit it in severe heat, but I imagine you’ll get some relief if you’re headed north to the mountains. Sounds like a wonderful new destination. We are in Salida and enjoying staying free at BigHornCanyon. We were very lucky and saw 7 this afternoon. Others that have been here for yrs have seen none. Yea! Do not know where to go next but your pick sounds fabulous. Enjoy and congrats on the 5k. We stayed for free in Salida last year and plan to return in September. Check out the free in-town Thursday night music in the park if you get a chance. We just got back from a week in the Durango area and stayed 24 miles outside of the city near Mancos in a great RV park with big spaces and lots of trees overlooking a cattle ranch — Echo Basin Ranch. It got busy on the 4th of July weekend but was quiet for the rest of the week. Has some full-time RVers who help manage the place and are very helpful with tips of places to enjoy. There is so much to do in that Four Corners area — we rafted the Animas; drove the San Juan highway and stopped in Dolores, Telluride, Ouray and Silverton; visited the Needles area in the Canyonlands of Utah; went on a trailride and steak fry; and enjoyed the Bar-D chuckwagon dinner show. 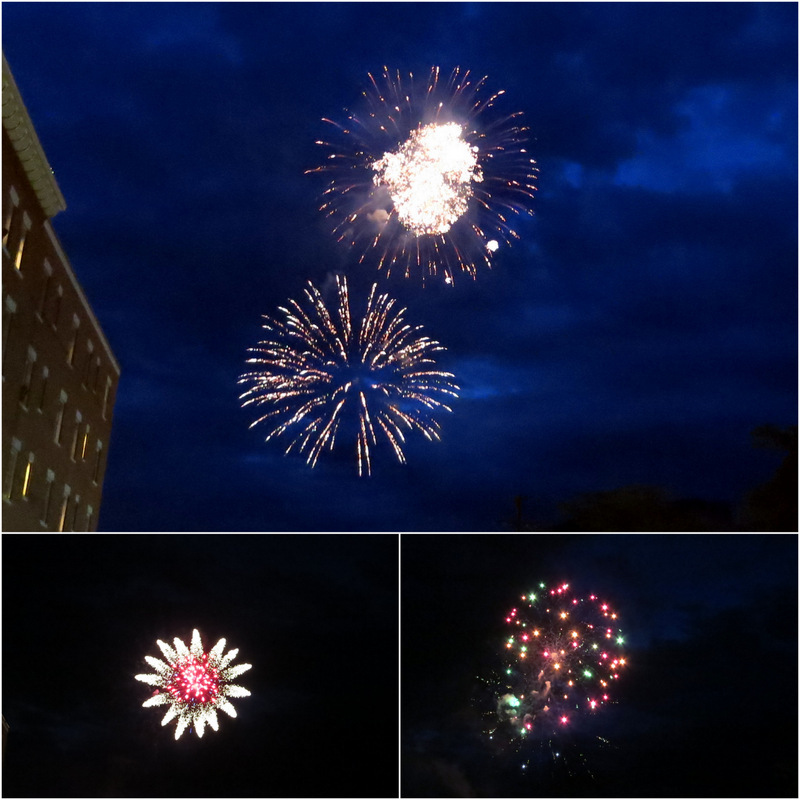 Enjoyed fireworks in Mancos and also shopped and ate in Durango — loved Home Slice pizza. A very full week! Wow! That was a busy week! I can’t believe you fit all that in. I’ve heard from other people how nice Echo Basin is. Someday we’ll have to check it out. glad you enjoyed your stay in durango. we are having fun up east of Altmont and exploring Crested Butte. rented a jeep and saw lots of beautiful flowers. will post pics when we have more reliable phone service. extended our stay here for a few more days. Yay for Crested Butte! We’ll be there next week to see the wildflowers. Can’t wait! Hilarious review of the Animas River trail! Looks like a fun ride (despite the impediments on the trail….) We like those little in-town RV parks, too, when we’re not staying out in nature somewhere. Looks like a good find — like you, we don’t care about bathrooms, pool or playground, but a laundry definitely comes in handy! I didn’t even mention all of the characters we saw on the trail. It was a busy, but fun, ride through town. The small parks are more our style. We don’t tend to use the amenities anyway, so why pay for them?